Political geography and geopolitics, electoral geography, social geography, urban geography, world cities and large metropolitan areas, borders typology and communication, sociology methods in geography, geopolitical concepts, connection between social dynamics and international relations, unrecognized states. Study areas: Northern Eurasia, Western Europe, Post-Soviet states, Russia, Ukraine, Northern and Southern Caucasus, Estonia, Finland, France, Italy, China etc. In 1993 Vladimir Kolosov created at the Institute the Centre (Laboratory) of Geopolitical Studies and is its Head. He was the principal investigator or headed the Russian part of 26 research projects supported by different Russian foundations, European Framework Programmes, CNRS (France), National Science Foundation (USA), Fondazione Giovanni Agnelli (Italy), Open Society Institute. A dozen of scholars in Russia and France prepared their PhD thesis and passed their habilitation under his tutorship. Professor Kolossov taught at Moscow State University and Moscow State Institute of International Relations. He is the author of about 350 publications, including 110 works abroad and 6 individual monographs; he was the main author and editor of 11 books. Among his main works are: Political Geography: Problems and Methods (Leningrad, 1988), The Spring-89: The Geography and the Anatomy of Parliamentary elections (Moscow, 1990, with Nikolai Petrov and Leonid Smirnyagin), L’Atlas de la Russie et des pays proches (Paris, 1995, with Roger Brunet and Denis Eckert), The Geopolitical Situation of Russia: Representations and Reality (Moscow, 2000; an Italian version: Turin, 2001), The World in the Eyes of Russian Citizens: Myths and Foreign Policy (Moscow, 2003), Political Geography and Geopolitics (Moscow, 2001, 2005, with Nikolai Mironenko), etc. Vladimir Kolosov acquired extensive experience of international scientific cooperation, teaching and research at foreign universities and laboratories. He obtained the scholarship of Brussels Capital Region (1991) and International Boundaries Research Unit (University of Durham, UK, 1992), the Fulbright Scholarship at the University of Colorado at Boulder (1997). In 1999-2003 Vladimir Kolosov was nominated as Professor at the University of Toulouse-Le Mirail (France). He was also visiting professor in the universities of Paris-Sorbonne IV, Paris I Panthéon-Sorbonne, Bordeaux, Le Havre and Tampere, and lectured in Ukrainian, Dutch, British, and American universities. He is on the editorial boards of Political Geography, Geopolitics, BelGéo, Eurasian Geography and Economy, Annales géographiques and other foreign and Russian academic journals. He is elected Foreign Member of French Geographical Society and Doctor Honoris Causa of the University of Le Havre. 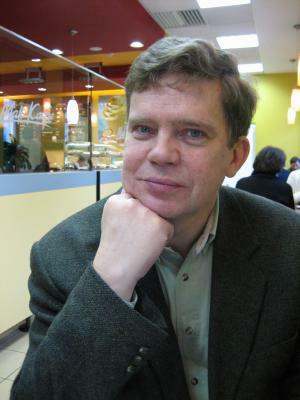 Since 1991 Vladimir Kolosov is involved in the activities of the International Geographical Union – first as a member and in 1996-2004 – as Chair of the Commission on Political Geography. In October 2006 he was elected Vice-President, in 2008 - First Vice-President of the International Geographical Union. At the 32d International Geographical Congress in Cologne (August 2012) he became President of IGU. He initiated, chaired or was a member of Organizing Committees of a great number of IGU workshops and conferences held in Russia, Ukraine, Italy and other countries. As a member of the Steering Committee he contributed to the programme of the International Year of Global Understanding initiated by IGU. He also contributed to a larger involvement of geographers from CIS countries in IGU activities and plays a leading role in the preparation of IGU Regional Conference in Moscow scheduled in 2015. O’Loughlin J., Kolosov V. and Toal G. Inside Abkhazia: A Survey of Attitudes in a De Facto State // Post-Soviet Affairs, 2011, vol. 27, N 1, pp. 1–36. Kolossov V. and O’Loughlin J. Economic insecurities and migration in the ‘de facto’ states of Abkhazia and South Ossetia // Eurasian Geography and Economy. 2011, 52, No. 5, pp. 596–630. Kolossov V. et Zotova M. La jeunesse russe et le monde. Représentations géographiques et vision du monde : origines et changements. - Anatoli (CNRS éditions), 2011, N 2, pp.249-264. Kolossov V. Post-Soviet Boundaries: Territoriality, Identity, Security, Circulation / Wastl-Walter D., ed. The Ashgate Research Companion to Border Studies. Farnham, UK: Ashgate, 2011. P. 171-194. Kolossov V., Thorez P. Métropolisation et place des régions dans le transport aérien en Russie // Bulletin de l’Association de Géographes Français, 2009-4, décembre, pp. 496-511. Kolossov V., O’Loughlin J. Social-Territorial Dynamics and Ethnic Relations in North Caucasus // Chapters of Modern Human Geographical Thought. Drobík T. and Šumberová M., eds. Cambridge, UK: Cambridge Scholars Publishers, 2009, pp.103-140. Kolossov V., Treivish A. Russian-Language Geography / International Encyclopedia of Human Geography. Kitchin R., Thrift N., eds. Vol. 1, Oxford: Elsevier, pp. 457–462. Kolossov V. and Borodulina N. Circulation - Security Dilemma and Border Regions: the Case of the Boundary Between EU and Russia / Regional Development in Central and Eastern Europe. Gorzelak G., Bachtler L. and Smętkowski M., eds. London et al. : Routledge, 2009. Kolossov V. and Toal G. An Empire’s Fraying Edge? The North Caucasus Instability in Contemporary Russian Geopolitical Culture // Eurasian Geography and Economy, 2007, vol. 48, No 2. pp. 202-225. O’Loughlin J., Kolossov V. and Radvanyi J. The Caucasus in a Time of Conflict, Demographic Transition, and Economic Change // Eurasian Geography and Economy, 2007, vol. 48, No 2. pp. 135-156. Perepechko A., Kolossov V., ZumBrunnen C. Remeasuring and rethinking social cleavages in Russia: Continuity and changes in electoral geography 1917-1995 // Political Geography, 2006, N 5, pp. 1 -31. Kolossov V. and Eckert D. Russian regional capitals as new international actors: the case of Yekaterinburg and Rostov // BelGéo, 2007, N 1, pp. 115-131. O’Loughlin J., Toal G., Kolossov V. The Geopolitical Orientations of Ordinary Russians: A Public Opnion Analysis // Eurasian Geography and Economics, 2006, vol.47, N 2, pp. 129-152. O’Loughlin J., Kolossov V. and Toal G. Russian Geopolitical Culture in the post-9/11 era: The masks of Proteus revisited // Transactions, Institute of British Geographers NS Vol.30, no.3 September (2005) pp. 322-335. Kolossov V. and O’Loughlin J. How Moscow is becoming a capitalist mega-city. International Social Science Journal, September 2004, 181, pp. 413-428. Kolossov V. Border Studies: Changing Perspectives and Theoretical Approaches // Geopolitics, 2005, vol. 10, N 4, pp. 1-27. Kolossov V. A “Quantitative” Analysis of the Geopoltical Situation in Russia. // Ekistics, 2005, vol. 70, N 422-423, pp. 315-321. O’Loughlin J., Toal G. and Kolossov V. Russian Geopolitical Storylines and Public Opinion in the wake of September 11: a Critical Geopolitical Analysis and National Suvey // Communist and Post-Communist Studies, 2004, vol. 37, pp. 281-318. O’Loughlin J., Kolossov V. and Toal G. A Risky Westward Turn? Putin’s 9-11 Script and Ordinary Russians // Europe – Asia Studies, January 2004, vol. 56, N 1, pp. 3-34. Kolossov V. “High” and “low” geopolitics: the images of foreign countries in the eyes of Russian citizens // Geopolitics, 2003, N 5. Kolossov V. After Empire. - Agnew J., Mitchell K. and Toal G., eds. A Companion to Political Geography. Malden, MA, Oxford, UK etc. : Blackwell, 2003, pp. 251-270. O'Loughlin J. and Kolossov V.. Still not worth the bones of a single Pomeranian grenadier: the geopolitics of the Kosovo war 1999, Political Geography, 2002, volume 21, Issue 5, pages 553-600 (June 2002). Kolossov V. and Turovsky R. Russian geopolitics at the fin-de-siecle. – Dawson A. and Fawn R., eds. The Changing Geopolitics of Eastern Europe. London: Frank Cass, 2001, p.141-164. Kolossov V. A Small State аs a Self-proclaimed Republic: Nation-Building, Territorial Identities and Perspectives of Conflict Resolution (the Case of Moldova-Transdniestria). – From the adriatic to the Caucasus. The Dynamics of (De)Stabilisation. Ed. by S.Bianchini. Ravenna: Longo Editore, 2001, p. 87-114. Kolossov V. Ethnic and Political Identities and Territorialities in the Post-Soviet Space. - GeoJournal, 2000, vol. 48, pp. 71-81.